If the vehicle has a roof rack, you can load cargo on top of your vehicle. We recommend to obtain the crossbars and fixing components needed to install the roof rack on your vehicle from an authorized Kia dealer. The crossbars (if equipped) should be placed in the proper load carrying positions prior to placing items onto the roof rack. 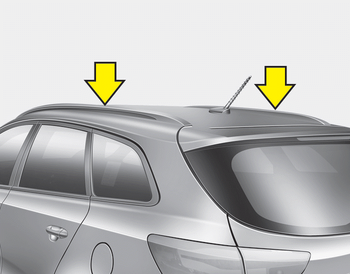 If the vehicle is equipped with a sunroof, be sure not to position cargo onto the roof rack in such a way that it could interfere with sunroof operation. When the roof rack is not being used to carry cargo, the crossbars may need to be repositioned if wind noise is detected. When carrying cargo on the roof rack, take the necessary precautions to make sure the cargo does not damage the roof of the vehicle. When carrying large objects on the roof rack, make sure they do not exceed the overall roof length or width. When you are carrying cargo on the roof rack, do not operate the sunroof (if equipped). The following specification is the maximum weight that can be loaded onto the roof rack. Distribute the load as evenly as possible across the crossbars (if equipped) and roof rack and secure the load firmly. Loading cargo or luggage in excess of the specified weight limit on the roof rack may damage your vehicle. The vehicle center of gravity will be higher when items are loaded onto the roof rack. Avoid sudden starts, braking, sharp turns, abrupt maneuvers or high speeds that may result in loss of vehicle control or rollover resulting in an accident. Always drive slowly and turn corners carefully when carrying items on the roof rack. Severe wind updrafts, caused by passing vehicles or natural causes, can cause sudden upward pressure on items loaded on the roof rack. This is especially true when carrying large, flat items such as wood panels or mattresses. This could cause the items to fall off the roof rack and cause damage to your vehicle or others around you. To prevent damage or loss of cargo while driving, check frequently before or while driving to make sure the items on the roof rack are securely fastened.